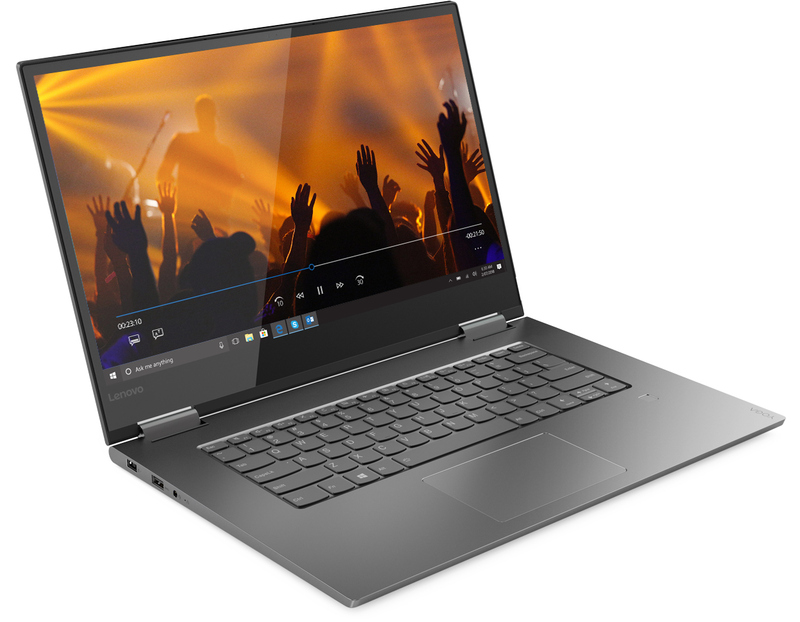 Lenovo at CES announced a new version of its Yoga C730 convertible laptop featuring a 4K Ultra-HD AMOLED monitor. The revamped Yoga C730 also uses Intel’s Whiskey Lake processors, but otherwise the new PCs are similar to the Yoga 730 launched last year. The key feature of the new Lenovo Yoga C730 is of course its 15.6-inch AMOLED display featuring a 3840×2160 resolution along with a very high contrast ratio (100,000:1), wide horizontal viewing angles, deep blacks, ultra-fast response time (e.g., 0.1 ms) as well as all the other advantages and disadvantages that the technology has to offer. The touch-sensitive monitor fully supports Windows Ink and comes bundled with Lenovo’s Active Pen 2 stylus that has 4,096 levels of sensitivity. Internal hardware wise, the Yoga C730 with AMOLED generally resembles the product released several months. The laptop is powered by Intel’s quad-core 8th Gen Core i7 processor that belongs to the Whiskey Lake family accompanied by up to 16 GB of DDR4 memory and a 512 GB PCIe SSD. The notebook also has an 802.11ac Wi-Fi + Bluetooth controller, a Thunderbolt 3 port, two USB 3.1 Gen 1 Type-C connectors, an HDMI display output, and a 3.5-mm TRRS audio jack, JBL-badged speakers, a fingerprint reader, a 720p webcam, and so on. The laptop can work for eight hours on one charge and comes in Iron Grey. Lenovo has multiple Yoga-branded convertible notebooks in its lineup, most notably the higher-end and more compact Yoga C930 (14.5 mm z-height, 3.04 lbs/1.38 kg weight) as well as the somewhat less expensive yet more bulky Yoga 730 (~17 mm z-height, 4.16lbs/1.89 kg weight). For some reasons Lenovo decided to equip the latter with a premium monitor and rename it to Yoga C730. Evidently, an AMOLED screen will make the new Yoga C730 more attractive to those who value good displays, but it is still a bit surprising that Lenovo decided not to upgrade its flagship consumer convertible. Lenovo’s Yoga C730 with AMOLED will be available starting March or April at an MSRP of $1,649. The Yoga C730 will not be the only 15-inch class convertible with an AMOLED screen as HP also introduced its Spectre 15 x360 with a 15.6-inch AMOLED monitor a couple of days ago.